The 2019 planner from lake + loft gives you space to plot out big dreams, set goals, and tackle daily to-dos in one lovely-looking place. The well-made and roomy planner is designed to be your all-in-one life command center with tabbed sections and fabric-covered pockets to keep everything neatly organized. Things like budget planning and motivational quotes live side-by-side to keep you on track while also keeping an eye on long-term goals. 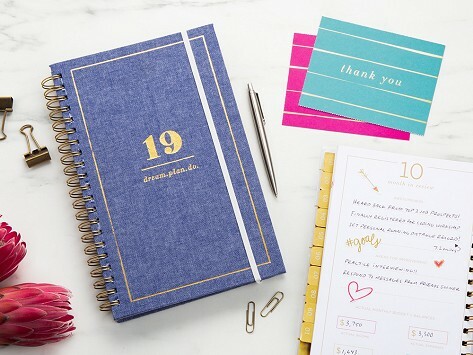 Colorful stickers and oh-so brilliant tear-out thank you and birthday postcards are thoughtful features that make this planner the one you’ll want to reach for. Dimensions: 7.88" x 11.25" x 1.5"
The inspirational daily planner from lake + loft is built to help make 2019 your best year yet. It’s a hub for all things you, from day-to-day tasks to big-picture goals and dreams. Robyn’s background as a stationery designer is evident in the finish of this inspirational planner. A hard cover opens to reveal fabric-covered pockets and neatly organized tabbed sections for things like monthly budget worksheets and a week at a glance. There are colorful stickers to add flair to the pages and tear-out thank you notes and birthday postcards are a brilliant and thoughtful time-saving touch. The planner helps keep you on schedule and keep tabs on monthly goals and wins all in one place. The well-laid out design leaves plenty of space for lists, notes, doodles, and dreams of all sizes to be jotted down, too.